Makoto Shinkai is known for a very distinctive style and tone of storytelling. A sense of minimalism permeates through his works, and the recent She and Her Cat: Everything Flows is no exception. As suggested by the title, this anime short tells a very simple story of a woman finding her place in the world, as shown from the perspective of her pet cat. There’s no grand conflict, no escalation of tension — just a bare, intimate story of life. The story of this 28-minute series is a reimagining of one of Shinkai’s earlier works by the same title, which took the same central conceit but with different characters. Befitting of such a mellow series, She and Her Cat: Everything Flows is immediately easy on the senses. Through the use of soft, delicate line art, gentle lighting, and a vibrant color palette, the animation team at LIDENFILMS creates an inviting atmosphere. The events on screen are accompanied by a consistent soft piano score, which helps to complement the emotional effect of each scene. It’s never overbearing, and it never overshadows the dialogue, creating a neat balance and ensuring there’s always something to hold the viewer’s attention. She and Her Cat: Everything Flows has a story to tell, albeit a simple one, and the simple and clear delivery of this story is always the top priority. Right off the bat, She and Her Cat: Everything Flows establishes the narrative style that will run through the rest of the series. 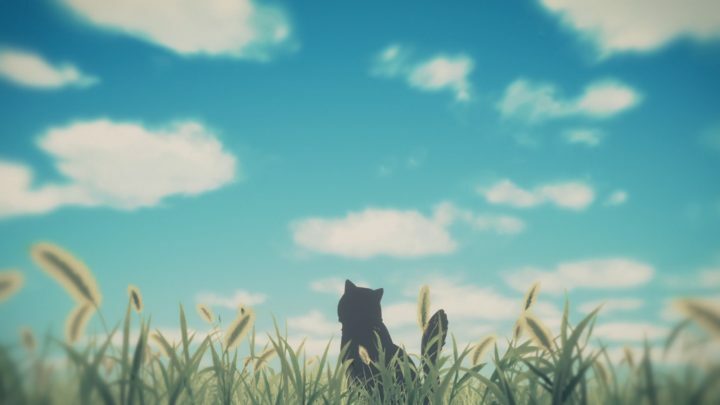 We’re introduced to our two protagonists: Daru, the observant, ponderous cat, and his owner, the sweet and hardworking, yet lost and confused Miyu. The story is presented from Daru’s perspective, with the events of Miyu’s life reflected through Daru’s observations. By nature of being a cat, he presents a subtly different perspective of the situation, accompanied by a rather stilted dialogue pattern and unique observations. The first episode sees Miyu living by herself after her roommate suddenly announces her departure. This immediately puts pressure on Miyu to remain financially stable, and maintain her independence. We see her struggle to force herself through numerous prospective job interviews, with each successive failure eating away at her confidence. We see her reject assistance from her mother, in a bid to cling onto whatever pride she has left. We see a woman on the brink of being crushed by the unyielding pressure of modern life. Daru, however, sees a woman with unyielding kindness and determination, fighting through the pain to find her place in a cruel world. The weight of everything on screen is immense. The slightly uneven, yet oddly elegant narration by Daru brings an uplifting spin to an otherwise rather melancholic story. The weight of everything on screen is immense, and it’s carried well both visually and audibly. Within the 8-minute runtime of this first episode, it’s easy to make an immediate emotional connection with the characters, which is a true testament to the writing and direction on display. It’s a strong start to the series, one that perfectly hits the mark between emotionally engaging and witty, and calm and relaxing. In the second episode, Daru brings up a very important bit of information: he can’t understand what Miyu is saying. However, this doesn’t mean that they can’t communicate. Both Daru and Miyu reflect on the circumstances of their meeting, so we’re whisked back to Miyu’s childhood to see how the friendship began. Miyu is feeling displaced and lonely after moving to a new town, so her mother brings a stray cat home to keep her company. The two don’t immediately get along, with Miyu convinced that she’d be better off alone. This culminates in her attempt to release Daru back onto the streets, but the two quickly reunite. After bonding with her classmate (and later, roommate) Tomoka, Miyu comes to the conclusion that she doesn’t need to be alone. In terms of writing and character progression, Episode 2 feels like a bit of a step down. It provides an invaluable insight into the background of our two protagonists, but the information this brings to the table feels rather undercooked. We see that Miyu had a rather troubled childhood, and that she holds a very high value on her relationships, but it just doesn’t quite reach the emotional peaks of the previous episode. The writing was pared back significantly this time, with more of a focus placed on environmental and reaction shots. The major takeaway here is in the communication, and the relationship between Miyu and Daru. Though the two can’t verbally communicate, they share similar thought patterns through their reactions to the same situations. 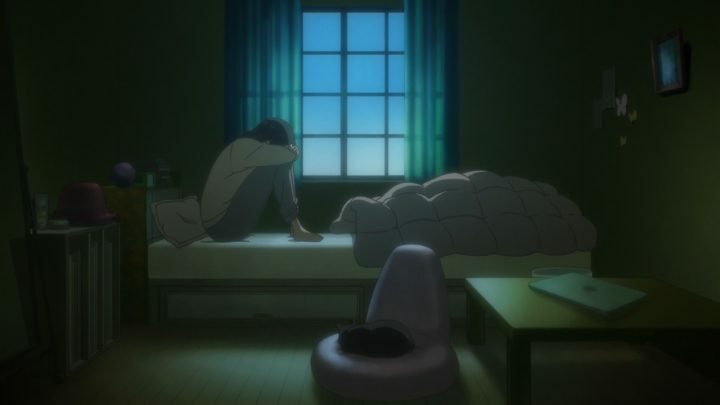 The episode closes out on a rather poignant reflection from Daru, as he acknowledges those fleeting, yet precious moments when his life intersects with Miyu’s. The two depend on each other, for company and for support, and this reflective episode serves to make that as clear as possible. While it doesn’t manage to deepen that relationship, or provide much food for thought, this second episode does bring a deeper feeling of intimacy to the table. In keeping with the reflective theme established in the previous episode, the focus of Episode 3 is on Miyu’s life after school. 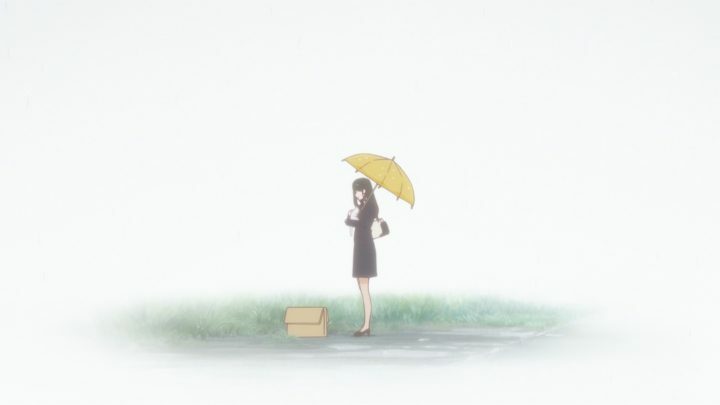 As she grows more detached from her mother, Miyu decides to move away from home. Her mother stands in fierce defiance, insisting that the family remain together to maintain their happiness. As Miyu puts on a brave face and pushes for her independence, we see her facade crumble in front of Daru, as she finally admits that she just wants to be together with her mother. Miyu’s unyielding determination to be independent, often at the cost of her personal relations, is a recurring theme at this point. Her will to find her own place is isolating her from her friends and family, but that desire to connect with others is always present. As the episode continues, we return to the present day, where we find out that Miyu is throwing herself deeper into her work. It’s shown with a great degree of subtlety, as Daru observes her extended absence from home and growing weariness. The episode culminates in Miyu’s admission that she feels trapped. As she ignores pleas for attention from her mother and her friend, she wishes for more control over her life. Although Daru has no means of communicating with his owner, he notices her plea for help and reaches out. However, the distance between the two is too great, and Daru is unable to comfort Miyu. The sheer desperation in the final scene is palpable. At this point, She and Her Cat: Everything Flows is covering some very real emotional ground. The sheer desperation portrayed in this final scene is palpable, though it never veers into excessive territory. The tone has taken a very melancholic shift, and despite the short time attributed to character development, Miyu and Daru are strong enough protagonists to make this shift feel appropriately weighty. The final episode brings the journey of Miyu and Daru to a close, though perhaps not with the finality you might expect. Thanks to Daru’s intervention, Miyu reconnects with her mother and friends. This isn’t done by a grand gesture, or a significant series of events, but rather through a very simple act. Without spoiling too much, the conclusion feels organic, and is handled with a subtle, yet appropriately weighty touch. 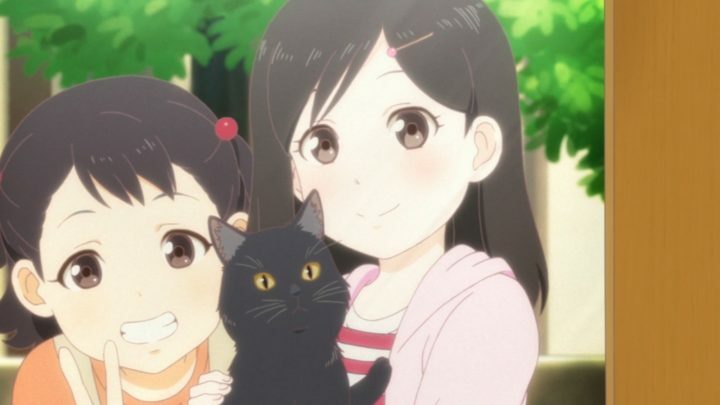 She and Her Cat: Everything Flows doesn’t tell a complete story; life is too big of a story to cover with all of its intricacies, but the story it does tell is satisfying, well-delivered, and thought provoking. The story is satisfying, well-delivered, and thought provoking. You may be wondering about the ‘everything flows’ moniker attached to the title of the series. Though it hasn’t directly been addressed until now, this subtitle serves as a very accurate reflection of the series’ motifs. Although the story of Daru and Miyu has come to an end, the story of life marches on indefinitely. Every event, every circumstance is interconnected, and the summation of our personal story is a reflection of our life experience. She and Her Cat: Everything Flows brings this concept to the forefront with a short, yet wonderfully engaging post-credits narration. The final episode of this brief series then should not be viewed in isolation, but rather as the summation of its parts. The detailed reflections sprinkled through the 28-minute runtime of the series, accompanied by the intentionally vague narrations and soft, evocative imagery bring the whole experience together. We finally see Miyu push forward with the determination that Daru always knew she possessed, overcoming her personal inhibitions. Such a conclusion would be comparatively unsatisfying without the appropriate level of character depth, but despite its brevity, She and Her Cat brings the story to a satisfying conclusion. She and Her Cat: Everything Flows doesn’t really tread any new ground. It’s a brief, introspective character drama, and although its unique character perspective provides some interesting insight, it doesn’t drastically change the flow of the series. The bond between pet and owner is invaluable, and the series does an incredible job of reflecting this bond. The delicate issue of mental health is also handled quite well, with a delicate hand and powerful emotional touch. The writing is consistently solid throughout, with some exceedingly thought-provoking and creative lines. With all of this, alongside top-notch presentation and stellar voice work, She and Her Cat: Everything Flows is an incredible ride throughout.